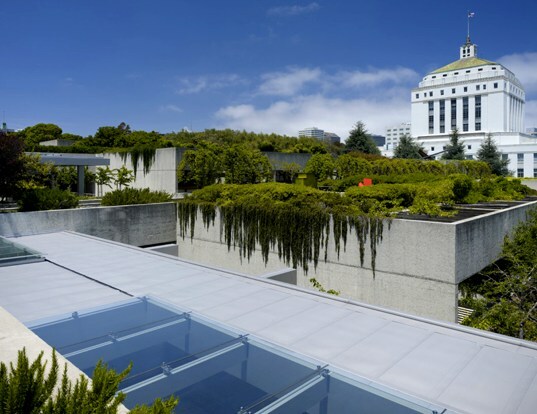 Forty years ago the Oakland Museum of California introduced a radical, modern, and green concept for a public museum -- and that vision is now being updated and preserved in a major renovation. The brutalist design by Kevin Roche was hailed as a landmark for its massive garden roof, extensive courtyards and low-slung concrete buildings that, for a casual observer, could appear like a long-abandoned industrial complex from afar. A major renovation is underway to preserve the extraordinary vision of this urban park and cultural complex while enhancing the interior to provide adequate programs for today’s needs. The 4 square-block museum displays traditional and contemporary art, natural history, and cultural history, although locals once referred to it as “the bunker” because of its low profile and many disjointed sections. The $62.2 million renovation by Architect Mark Cavagnero aims to change that by bringing in much more daylight and opening up the maze-like galleries. The renovation will allow the galleries to host extensive showings and will create a state-of-the-art archives for the more than 2 million objects in storage. The most obvious change is a new covered entrance and unified lobby. The isolated spaces are brought closer into circulation, encouraging visitors to mingle in Dan Kiley’s extensive gardens, the galleries and the patios. The museum is located just south of downtown Oakland, where it has always acted as an island, due in part to its design and a 1940s era 12-lane road that separated it from Lake Merit. The lake has long been a favorite of pedestrians and joggers, and a new revitalization project will link the museum, adjacent community college and park system together to create a major urban green belt complete with new wetlands. Although for the last couple of decades many cities have sought to build the boldest and baddest new museums, we should also look forward to polishing our older urban gems and renewing our urban vitality. 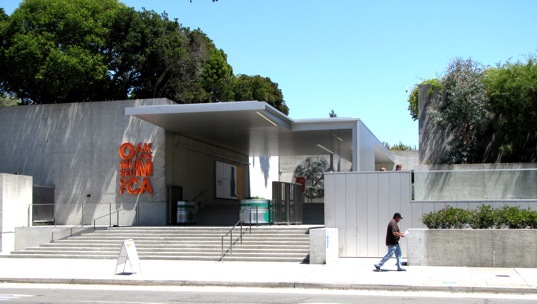 Image by Craig Michler The Oakland Museum of California was established in 1969 to showcase art, California history, and the natural sciences. Considered an encyclopedic museum, the sprawling 300,000 square-foot facility holds nearly two million artifacts. Image by Craig Michler Sitting on four blocks in the heart of downtown Oakland, the museum has been referred to as "the bunker" for its sprawling low profile. It is a public park and museum facility rolled into one. The renovation by Mark Cavagnero and Associates has kept a keen sense of the original brutalist conception but improves upon deficiencies like the lack of proper daylighting. A dearth of natural daylight has been amended by wrapping galleries with glass and reflecting light deep into the spaces. Additions are subtly mixed with the original building. The intent is to improve the flow of the facility as well as the overall useablity of the departments. The overall redesign is a whisper rather than a shout. An extensive reworking of the gallery spaces allows the museum to showcase today's contemporary exhibits, many of which require complex curatorial needs that the original galleries were unable to provide for. Image by Craig Michler The galleries are located throughout three distinct levels that are stacked one upon another. You reach them by ascending multiple wide courses of stairs, which in turn frame the gardens. Image by Craig Michler The museum's design aims to create a place for the public to freely gather. Multiple patios, mezzanines and grassy areas drape along the stark concrete buildings. The renovation links the multiple outdoor areas together with a more logical traffic flow. Image by Craig Michler Pehaps the most the most compelling facet of the museum's design is an extraordinary park and green roof designed by noted landscape architect Dan Kiley that dramatically softens the building's profile. At times it can be difficult to distinguish building from land. Image by Craig Michler Multiple terraces and planters allow foliage to drape over the walls. Image by Craig Michler The architecture can be subtle - here it overlooks downtown Oakland's popular Lake Merit. 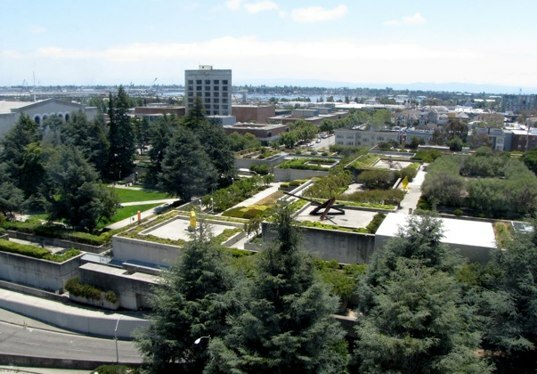 The museum's role as an urban park has never be fully realized due to the poor circulation within the space and the hardscapes and roads cutting the museum off from the adjacent Lake Merritt. Voters overwhelmingly approved a measure to fund a redesign of the neighborhood that allows pedestrian, bike and even kayak access. The museum's garden will finally be integrated with the city's downtown green space.